If memory serves sufficiently, then the purportedly imminent Singularity, such as it is envisioned in various novels by the esteemed Australian science fiction writer Greg Egan, is no more evenly distributed than is — as William Gibson put it with a characteristic axiomatic repeatability that unfortunately evades Egan — the future that is already here. Egan is the poet laureate of post-human rationalism, and in his vision, not every server farm unto which we might upload our consciousnesses runs at the same speed. There will be haves and have-nots in the post-digital future, just as there are in the digital present, and were in the pre-digital past. There will be, in the year 2050, those enjoying whatever the consensual-hallucination equivalent of retina display is, and there will be those plodding along on an old server just about capable of projecting its population as something more like virtual Lego figures. This all came to mind during a repeat listen to the chiptune collection Bit Pairat by Kupa, aka Cristian CÃ¡rdenas, who is based in Mexico City, Mexico. It opens, wisely if not uncommonly, with its strongest track, “Perdido,” which manages to be one of the best attempts ever to render dub with 8bit tools. It’s highly recommended, if only to experience the thick echoes of dub reproduced as blocky wave-like patterning. 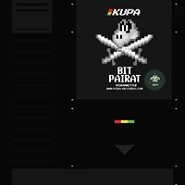 More on Kupa/CÃ¡rdenas at soundcloud.com/kupa, twitter.com/thakupa, and myspace.com/thakupa. 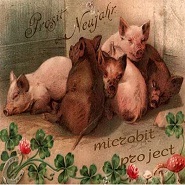 The Microbit Project release Prosit Neujahr on a Russian netlabel also named Microbit is three brief tracks of light glitch. How light? There’s as much space as there is sound, and rarely more than two elements at once. How glitch? Short bursts of a restricted number of elements play off each other, like a forgotten algorithm caught in a tight nested loop. The result is a series of semi-random occurrences, not so much melodies as the occasional repetition of proximate materials — parallels that once in awhile make themselves heard, and leave the remote expectation of reappearance. It’s a tune that is broken, yet just barely functioning — that is a glitch rudiment, perhaps the glitch rudiment. The first track is the keeper, tiny little digital marbles making their way on a lightly textured grid, bounding, bouncing, wavering (MP3). There’s a delicacy to the track that is especially enticing, the way the thin wisps of audio play atop a low hum that serves to highlight their near-ephemeral quality. Three tracks in all, at archive.org and microbitproject.blogspot.com. It starts as a light hum, a buzz saw made of feathers, God’s own electric toothbrush as muffled by a locked bathroom door and a running shower. And then the buzz grows. Not in the imagination, like the neighbor’s water heater that seems to be going through a growth spurt but is really just draining your emotional reserves at 3:27am; this buzz really grows, getting more chaotic, even if its volume remains relatively set. It gets denser and wilder, but being a buzz, the wildness is also a kind of softness: more bristly sonic fibers per second. It goes on in this way for more 13 minutes, courtesy of musician Brendan Murray (MP3). And then, about five minutes before it comes to a close, the sound shifts drastically. What happens at that juncture is like nothing so much as a phone call that’s been cut short. Of course, dial tones don’t exist like they used to. Phone calls, generally speaking, go dead, not into a drone of telecom nullspace. And so with that illusion dispelled, the dialtone drone shifts, slows, into a wave form. It’s here that Murray really gets going. Up until that juncture, the track has earned its Zen credentials. Now patterns emerge from and alongside that wave form, layers of sonic cumulus, hovering, creating moires, delicate counterpoint, pointilist minimalism. The compositional/improvisational pursuit is a pleasure to witness as it unfolds. Track originally posted at rarefrequency.com. More on Massachusetts-based Murray at buttonpushing.wordpress.com and, of course, twitter.com/buttonpushing. Genres don’t die. They just slow down and take root. Ask any current bebop, rockabilly, or drum’n’bass crew. Sometimes the rooting is regional. To dive into the world of electronic music in the former Soviet Union and related territories is to find deep outposts of late-1970s-era fusoid proto-electronica, wafty vapors whose attempt to signify etherealness is at odds with the histrionic drama of chords sturdy enough to use as a hammock. And, increasingly, and perhaps preferably, spending time in Slavic record bins (or their virtual equivalent) also means finding numerous albums that could have been released on the Ninja Tune label during its early heyday, the mid-1990s. 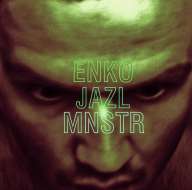 Case in point, the recent album Jazl Mnstr by Enko, aka Enkolf Kitler, who lives in Moscow but was raised and educated in the Ukraine. Heavy on rhythm, it’s drums and bass but not, for the most part, drum’n’bass. Once upon a time this would have had the name Funki Porcini or Amon Tobin on it. Heard at this late date, the emphasis on rhythmic play sounds “post-rock” at times, the way it employs the cornerstones of a band but prods them, probes them, toward their own end, rather than merely utilizing them as a supporting structure for a vocalist. Of course, like a lot of good post-rock, the band format that Enko is probing isn’t really a rock band at all, but a jazz one. “Kont (JZL)” opens with a round-the-kit drum pattern that’s all loose and world-weary, and little at all changes even as slow strips of synthesized tones get layered atop it (MP3). “Max Mospin” explores similar territory but at roughly half the pace, and the sound is as if it’s being recorded from the other end of an impossibly long rectangular room (MP3). 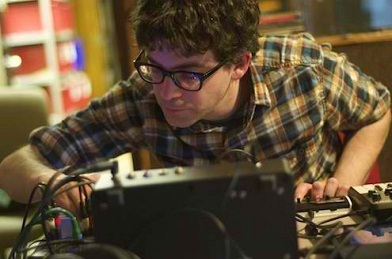 One major treat is the opening track, appropriately titled “Sparking Noise,” that’s all glistening static and notes that proclaim themselves as the penultimate moments of some epiphanic melody, and yet never quite resolve; if a synthesizer were a can of soda, this is what it would sound like when you popped it open (MP3). Naysayers can dismiss such genre enclaves as holding patterns, but genres can be like clocks, which even when broken tell the correct time twice a day. For every coolhunter who thinks a certain type of music’s time has come and gone, there’s another noting how such-and-such classic sound is back. (The same can be said of food criticism: “Oh, sushi is so 1980s.” “Oh, comfort food like mashed potatoes and chicken fried steak is suddenly all the rage.”) Hems go up; hems go down. Best to ignore the trendwatchers and appreciate the level of dedication of the parties involved. Album released on the Bypass netlabel at archive.org. More on Enko at his last.fm page.